Top Level Podcast - Take Your Magic to The Next Level. Make More Top 8s! Here’s his thinking: Commence the Endgame is a hefty six mana, yes; but it does everything he ever wanted. 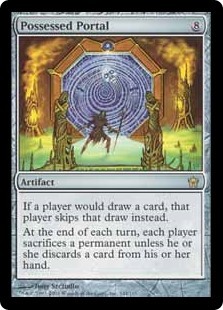 It draws “only” two cards. But instead of the other two cards he might get from, say, a Dragonlord’s Prerogative, the rest translates into a kind of Maro. This, of course, feeds into his new pet mechanic: Amass. Patrick is a little less impressed. “It’s just another card draw spell that makes a dude,” says the Hall of Famer. Don’t love Commence the Endgame? 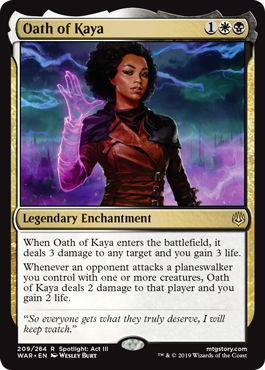 Mike posits Oath of Kaya might be the actual best card in the set. It’s like a slow Lightning Helix. Throwback to fourteen years ago: Mike wrote the original preview for Lightning Helix on the Mother Ship! But it’s not just a slow Lightning Helix. This card is a massive disincentive to anyone wanting to play fair Magic at all. Remember all those shiny Viashino Pyromancers WotC gave away to MTG Arena players a few months back? They’ll never see the light of the stage or the ning of a strike again. Not with this around. It’s not actually unkillable. It is, in fact, very difficult to kill. 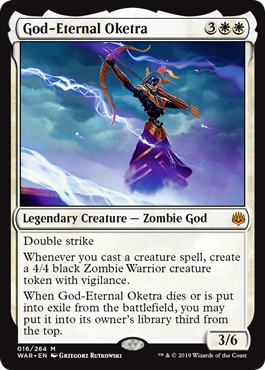 God-Eternal Oketra is also an amazing card advantage engine! “People have built their entire deck design around much worse value than ‘cast any creature'” in the past. This card seems tailor made for G/W. It prevents you from being punished for drawing a late game Llanowar Elves. In fact, you’ll get a nice five-damage-for-one-mana return on one of those! Additionally, cards like Growth-Chamber Guardian will be extra useful as they can help ensure a steady stream of triggering creatures. Just a great card. Our intrepid duo talk more and more great cards! War of the Spark just keeps giving them to us! We have no idea what Standard will look like in a couple of weeks; but it’s going to be… Different for sure. Feather, the Redeemed requires little-to-no actual redemption. Normally when someone tells you they have a 3/4 flyer for three mana you ask them how much damage you are expected to accept in return. This one actually gives you an insane card advantage engine in exchange for being charged negative-one mana in creature casting cost. Modern: Aurelia’s Fury – Remember this card? It’s like a Fireball and an Abeyance fell in love, got married, and had an instant speed baby. Conveniently, Aurelia’s Fury is already in R/W! At four mana you can ping Feather, ping your opponent for one, and lock them out. Until they can break up this combo, the opponent will be unable to cast non-creature spells on their turn. Because you ping Feather, you get this one back; because you ping the opponent, the clock gets one faster while ruining their plans. Modern: Lightning Helix – Nice job having four toughness, Feather! At four mana you can just hit Feather on your turn AND on the opponent’s turn to gain six per turn cycle. Obviously at its most effective against an opponent who is unable to deal the fourth point but also is trying to kill you with damage. Standard: Defiant Strike – An Opt machine! Standard: Reckless Rage – Perhaps the most exciting showcase of what Feather can do, Reckless Rage from Rivals of Ixalan gives you a “Slaughter with buyback” for one mana per cycle. Time Wipe – You can cast this even if you don’t have any creatures. No surprise there. But what if the opponent doesn’t have any? 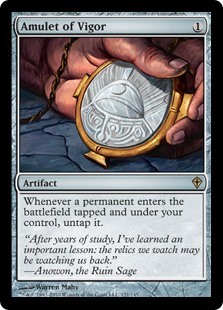 Time Wipe to bounce your own Augur of Bolas is… Not horrible. A five mana Boomerang is way better than a dead card. 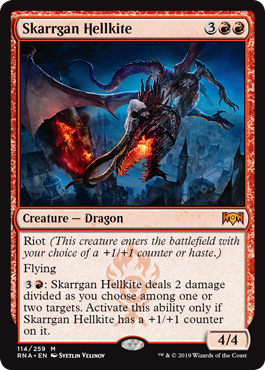 The newest take on Chandra starts off with a very different kind of ability for a Planeswalker… A non-loyalty one! It’s important to note that it doesn’t matter who removes the counters from Chandra — you or your opponent — or how they are removed. You can take them off with that [-7], or by operating a Heart of Kiran in some format. 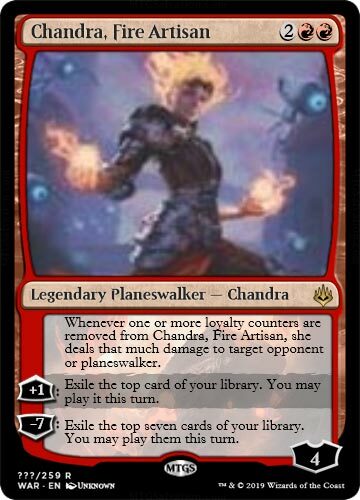 Or, in the most obvious scenario, you tick Chandra up from four loyalty to five; the opponent attacks her to death… And gets five to the face for his trouble. But let’s talk about that [-7] for a second, shall we? In addition to a Wheel of Fortune like effect (that doesn’t force you to discard your hand!) Chandra will give the opponent a zinger for seven. That’s kind of like an Ultimate itself, isn’t it? This new Chandra is going to be an important tool in the new Standard. It’s probably easier to work with than Experimental Frenzy, for instance. A Red Deck is far less likely to “get stuck” than under Frenzy, because Chandra lets you keep playing cards normally, on top of her [+1]. And when you go [-7] to try to finish the game? A Red Deck can both appreciate dealing seven to the opponent’s face and have a low enough set of casting costs to actually take advantage of the Ultimate’s time limitation. Verdict: This card is going to be awesome in Standard! Dreadhorde Invation – Patrick thinks one of Mike’s favorite cards so far is only pretty good. Just remember that a 1/1 ground creature (or +1/+1 counter) is much worse than a whole new 1/1 flyer. Bolas’s Citadel – How much would you pay for an Experimental Frenzy that would not shut down your ability to use your hand? All these, and tons more! 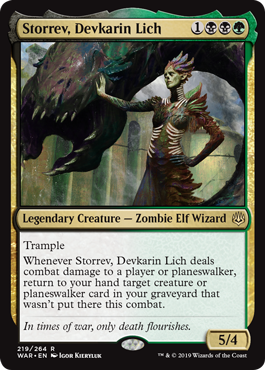 Storrev is “only” 5/4 Trample… But on the other hand it doesn’t cost you a life per turn. Furthermore, being Legendary is actually an upside in a world where Cast Down is one of the most common removal cards. Storrev is essentially a 5/4 trampling Ophidian. For a card of this type — which often come out at 1/3 for three or even four mana in the case of Thieving Magpie — Storrev has outstanding power and toughness. Trample is really meaningful here! The opponent can’t just throw chump blockers or small token creatures in front of Storrev in order to prevent the card advantage trigger. Hand in hand, the ability to attack opposing Planeswalkers (and not just opponents themselves) makes Storrev a highly flexible attacker and source of card advantage. What Might You Want to Get with Storrev, Devkarin Lich? Storrev is fine as an attrition / grinding tool. Or as the realization of the old Jamie Wakefield “it’s the last fatty that kills you” theory. Storrev can clean up after you’ve traded a bunch and that’s great. However, you can also do some aiming with this card. Here are some ideas (that, admittedly, transcend just Standard). Sakura-Tribe Elder – You can play the Rampant Growth-like Staple Snake to get Storrev out on turn three… And then get it back with your first attack! Cycling creatures – One of Storrev’s strengths is the ability to “aim” its card drawing, rather than just drawing whatever is on top of your deck. But if you want that kind of ability, creatures with cycling or landcycling work great. Engine! Plaguecrafter – Sacrifice this to itself and you can clear a path for your Legendary Zombie Elf Wizard… And have fuel to clear a path again next turn. Explore creatures – Merfolk Branchwalker and Jadelight Ranger can put random creatures into your graveyard… Right where Storrev can get them back for value! Planeswalkers – Especially some of the new War of the Spark ones that only have “minus” abilities. Reload! It’s not just that Gruul Aggro won Grand Prix Kyoto last week… There have been several different types of Gruul decks popping up (and performing) in Standard. Tell me about Gruul Guildgate in Gruul Aggro? Gruul Guildgate is not usually the kind of thing you want to see in an aggressive deck. It comes into play tapped, so can be curve-contrary… Best on turn one, Gruul Guildgate is a non-bo with the aggressive one drops we often see in Red Decks. 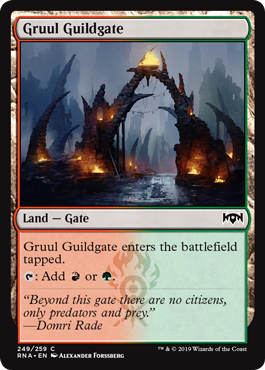 That said, Gruul Guildgate is an important source of green for the red-heavy version. It’s not so much that you need green for creatures; Unclaimed Territory set to “Warrior” can cast all of Goblin Chainwhirler (red), Growth-Chamber Guardian, or Kraul Harpooner. Part of what makes Gruul is the availability of wild cards like Cindervines for the sideboard; and you need good old fashioned green mana for that. Sorry, Wilderness Reclamation. Another way to run Gruul is a Riot-themed version with Rhythm of the Wild or Domri, Chaos Bringer. Yoshihiko Tokuyama finished third in Kyoto with a Dinosaur deck that started many of its monsters sideways. Domri, Chaos Bringer is great as a one-of. It not only adds a dimension to a creature deck, it gives the Gruul Dinosaurs resilience against sweepers. Plus, the fact that both your bodies on Regisaur Alpha can come down swinging is a meaningful dimension. 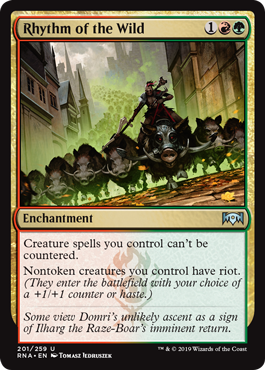 Multiple sources of Riot (say both Domri and Rhythm of the Wild) are not really diminishing returns. Why not choose the +1/+1 and haste? 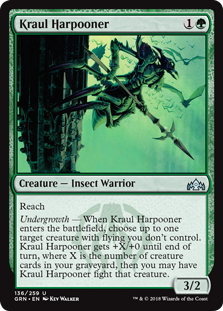 Not for nothing: But Kraul Harpooner is already one of the strongest two drops in Standard. The fact that some kind of a haste engine can level this card up so much — especially against control — broadens the impact of that already-awesome card. Most Gruul builds can’t cast Statue at all. Try adding that card to a Goblin Chainwhirler or Skarrgan Hellkite. You can give your creature deathtouch to splatter two (or all) of the opponent’s creatures in one sweet sweep. See what happens when you give me deathtouch. You won’t believe what Mike’s favorite deck of the week was. We’ll give you a hint: It was a Rhythm of the Wild deck. And not a Gruul Aggro. Really! 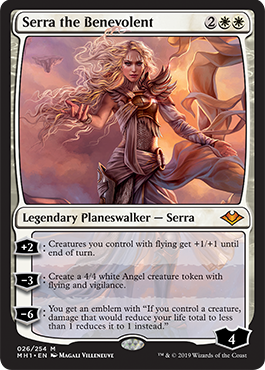 Serra the Benevolent is an exciting Planeswalker from the upcoming Modern Horizons set. [+2]: Creatures you control with flying get +1/+1 until end of turn. 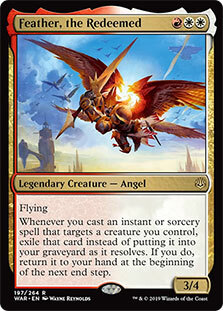 [-3]: Create a 4/4 white Angel creature token with flying and vigilence. [-6]: You get an emblem with “If you control a creature, damage that would reduce your life total to less than 1 reduces it to 1 instead. Patrick sees some immediate applications of Serra here… Spirits can cash in on her [+2] ability, and having any sort of creatures is great with the [-6]. An even better home might be a flying Tokens deck with Spectral Procession, Bitterblossom, or Lingering Souls. A deck that goes super wide with efficient flyers can really benefit from Serra’s [+2]! The “fail state” of [-3] is really where Serra shines. Her worst implementation is to just make a Serra Angel for only four mana (instead of five). Plus you generally get to keep your Planeswalker in play, and might be attacking with a vigilant five the next turn. Serra’s “Worship” [-6] is extraordinarily powerful. First off, people play with actual Worship in Modern sometimes. Being an emblem, hers is a “Worship” that can’t be removed by Cindervines! Try interacting with that! The Top Level Podcast boys spend only a short amount of time on Serra up there. Most of this monster Modern podcast is spent across the many events from last weekend: Classic, Open, and even Grand Prix! Prismatic Omen – Mike likes this throwback for Valakut decks; Patrick loves the first one, whether or not a deck plays two or more. Prismatic Omen gives a Valakut deck a completely different chip-shot game plan so it doesn’t have to go all-in. Tireless Tracker – Love it and love it (ditto). In Golgari, the presence of this three drop makes up for some of the missing red card advantage; meaningfully difficult (though clearly not impossible) to Fatal Push. Anafenza, the Foremost! Awesome addition for Humans; may have wider applications in other archetypes. Incredibly high floor, but far from unbeatable (so not a great sideboard card). Just a great card. 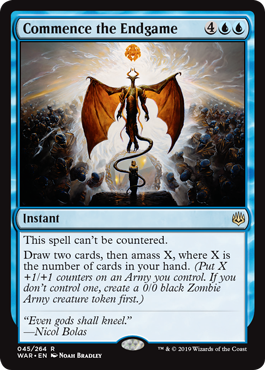 Tempest Djinn… Would be bizarre playing next to Timely Reinforcements. Mike thinks this might be the Djinn’s moment, though; due to an all-time low in Grim Lavamancers. Amulet Titan is among the filthiest decks there is! It has a lot of bad cards, a high failure rate, is mostly just air… But when it works, it WORKS. This deck can start with an Amulet of Vigor to get incredible value from the “Karoo” cycle from the original Ravnica Block. Just imagine the fun of playing a Primeval Titan (ahead of curve, of course) and searching up a Slayers’ Stronghold and Boros Garrison. The Garrison will enter the battlefield untapped, so you can immediately make RW to activate the Stronghold. Now your Primeval Titan can attack, searching up two more lands, for greater and greater nonsense. Karoos usually slow players down. They bounce a land when entering the battlefield, after all; but in a deck with Amulet of Vigor, they can actually net mana before bouncing themselves; or make a mess with Tolaria West. Ever think about searching up Tolaria West and a Simic Growth Chamber with your Primeval Titan, tapping them both for mana, bouncing the Tolaria West… And then searching up a Pact of Negation to protect your incoming 6/6? Normally a Whir Prison deck will deck you with Ipnu Rivulet, recycled with its Crucible of Worlds… Or maybe get you over and over, two at a time, with Pyrite Spellbomb and Academy Ruins. But mostly? It beats you by submission. By cruel and unrelenting horrible-ness. And it’s not like anyone pays eight for this thing. Not with Whir of Invention in their decks. Mike’s beloved Red Deck is really, really badly positioned just this second. Not only is Dredge back in flavor — what with its innumerable free Lightning Helixes that cost neither a card nor mana — but other matchups can be equally challenging. Oh my God is that Mono-White Martyr of Sands? Izzet Phoenix in Modern… And Legacy? We saw Arclight Phoenix jump back into Top 8 action just last week… Standard’s Mythic Championship Cleveland was the stage. The player in question, none other than the legendary Luis Scott-Vargas. But it’s not clear that Arclight Phoenix even belongs in the best Standard U/R deck! The same is not true of Izzet Phoenix in Modern. If anything, this is considered the strongest current deck in Modern… And it’s not hard to see why. Izzet Phoenix has some stoopid stupid draws. Mountain, Fathless Looting; discard two copies of Arclight Phoenix. Gut Shot you. Gut Shot you again! Is that the most common first turn? Obviously not. But it’s certainly an available one. 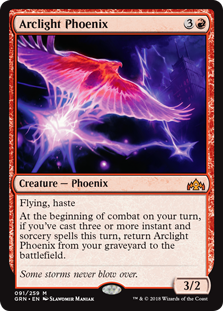 Izzet Phoenix has a ton of perfectly fine regular draws that are super aggressive while remaining card advantageous. Mike and Patrick discuss the various cheap card drawing spells in Modern. Most important might be Faithless Looting. Mike doesn’t think this one is long for the format. It’s certainly been a problem child in a variety of decks before! Patrick thinks that Manamorphose might be the most broken of the cheap card drawers; but Mike draws a distinction at the one-versus-two-casting cost line. This dovetails into Patrick wondering how Grixis players pick which cantips they play in Modern, and how many! Why isn’t Arclight Phoenix a Bigger Deal in Legacy? A different Izzet deck won last weekend’s Legacy Open — a Delver of Secrets deck! 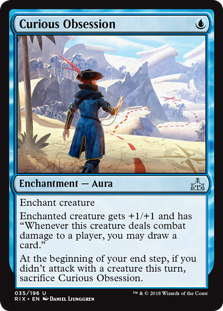 Izzet is a great strategy in Legacy, due to the strength of cards like Brainstorm, Ponder, Preordain… and now Light Up the Stage! Light Up the Stage is very Treasure Cruise-ish, and easily catalyzed by Pteramander or Delver of Secrets on turn one. But look at those cantrips: They’re great, but they don’t put creatures into the graveyard! There are no Faithless Lootings or Thought Scours in the Legacy builds. Therefore getting the Phoenix into the graveyard (where it can work its proper mischief) is a little more challenging than in Modern. There are some emerging Grixis deck lists that are looking to solve the Arclight Phoenix problem. And because it’s Legacy… The solution is pretty a good one. How many lands is right? 19 Islands? 20? … And should any of them match with any others? How many copies of Entrancing Melody? Main deck or sideboard? Ditto on Exclusion Mage. Or Jace, Cunning Castaway? One thing’s for sure: Mike thinks Experimental Frenzy and friends is the right way to go in Standard moving forward… But his beloved Goblin Chainwhirler and friends did not back up its reputation against Mono-Blue in this Top 8 specifically. Patrick disagrees greatly, despite our duo’s mutual appreciation of the all-new Cindervines. “Greek Mythological Figure” Luis Scott-Vargas also returned to Top 8 play (since, you know, his last appearance at the last Pro Tour) as the Arclight Phoenix pilot. Why might you play Arclight Phoenix instead of Drakes? Why might you play the card basic Mountain at all? Are there any Ravnica Allegiance cards to play in this deck? Mythic Championship Cleveland gave us some spicy options outside of the Top 8… And some all-new decks that you may not have seen before. Into Control? Sure there was Esper in the Top 8, but that’s not the only Thought Erasure deck in the format. Check out Seth Manfield’s Dimir Surveil build… With zero main-deck copies of Sinister Sabotage! Straight Beatdown more your game? There were multiple takes on Mardu with Judith, the Scourge Diva. Whether you’re into Mavren Fen and the Vampire squad or hastily dominating the Red Zone with Heroic Reinforcements, Standard has some corners still worth exploring. Or our favorite… Hall of Famer Raph Levy was into Merfolk Trickster… Just not as into Merfolk Trickster as all those Planeswalkers in the Top 8. Raph only played two in his Simic Merfolk deck. Bask in the aura (and recoil from the fishy odor) of thirty marauding Merfolk! Theme is broken here only for four copies of Kraul Harpooner in the sideboard. Truly a spicy brew that both our hosts would gladly sleeve up.